This unique 1965 Ford Mustang hardtop will be up for grabs at Mecum’s 2017 Indianapolis auction. This Mustang is somewhat unique and is believed to be the first hardtop produced to receive a VIN. Preproduction 1965 Ford Mustangs are extremely rare. But the fact that serial number 00002 still survives is an added bonus. This Mustang looks showroom new after a two-year restoration. Mustang 00002 is equipped with a 170 cubic-inch six-cylinder engine attached to a three-speed manual transmission. The current owner, Bob Fria, has owned this Mustang for the last 20 years. 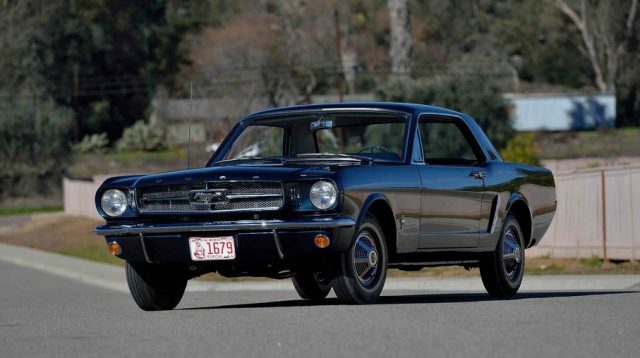 It’s estimated that this pony car will fetch anywhere between $450,000 to $650,000 when it comes up for auction on May 20th. That’s quite an investment but at least it comes with free bragging rights. Check out mecum.com for this and more great muscle cars coming up for auction. Update: The 1965 Ford Mustang did not meet reserve and was unsold.